Major Frank Cross: [terrorists are aiming their weapon at the taxi he is driving] Could someone bring me my gun? I don't know who I felt sorry for more in this movie, Roy Scheider or Dolph Lundgren. Roy Scheider was a one time big box office star who's now appearing in low budget action films. 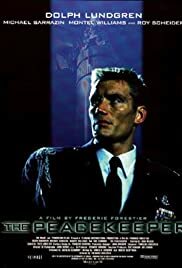 Dolph Lundgren aspired to rise above B action movies and I heard he even quit movies a few years ago out of disgust, only to return to yet another low budget role. Roy plays the president, and speaks in a delicate southern accent that seems completely out of character for him. Dolph plays the hero (natch) but he's showing his age and looks really silly when he runs. The movie? Mix together the last several straight to video action dramas you've seen. Everything from the camera angle to the canned music soundtrack seems like stuff you've seen dozens of times. I'm beginning to wonder if movies like this don't all come from a parallel universe where things happen the way they do on screen, they all seem like they have interchangeable parts and were made by the same person.